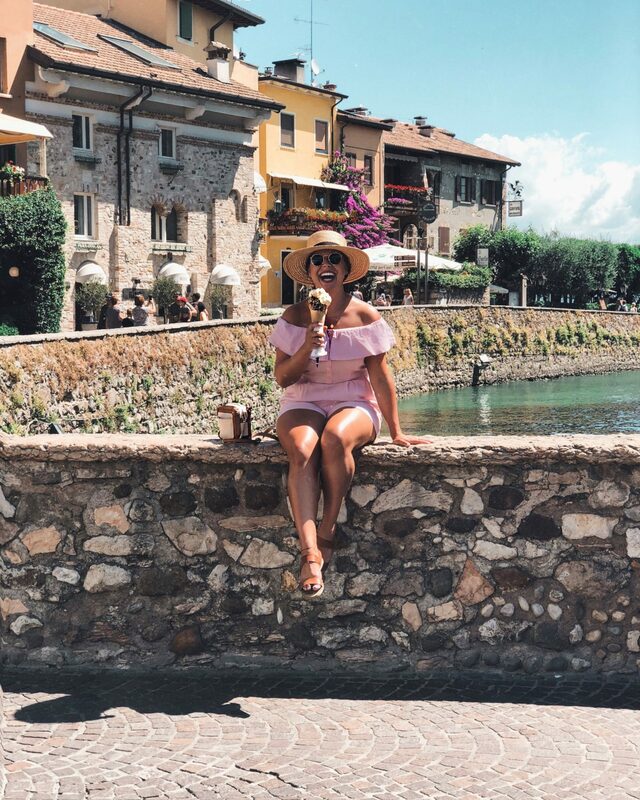 Italian holiday destinations are so diverse, you can return to a different spot every year and feel like you’re visiting a whole new country with the changing landscape, menus and even people. 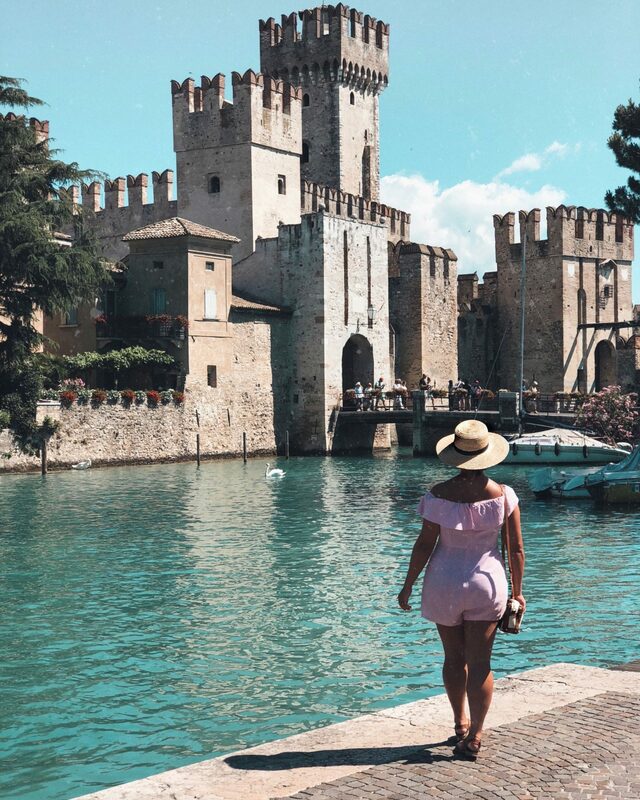 This isn’t a comprehensive Lake Garda guide, but if you’re heading to the south west region, there’s enough here to get you started and plan a nice itinerary for a short stay. I flew into Milan (Linate) with Aer Lingus, before driving the hour and a half journey to Lago di Garda. You won’t be short of Lake Garda hotels to choose from. We wanted something really chilled, with loads of space, good food a little bit back from the crowds. The entrance to Palazzo Arzaga is spectacular. After driving through the Italian countryside, you turn off onto a little dirt road before arriving to the gated property with its well manicured gardens. You can drive all the way up the tree lined path to the courtyard where the staff will whisk your car away and bags to the room. 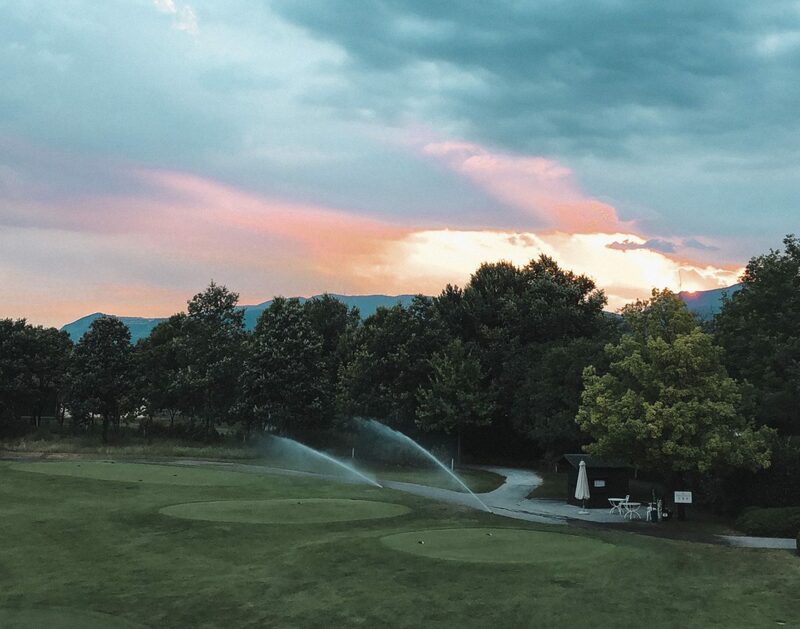 We ordered a bottle of Lugana (a wine region just south of Lake Garda), popular with visiting tourists, and settled in for sunset views from the terrace overlooking the lawn. 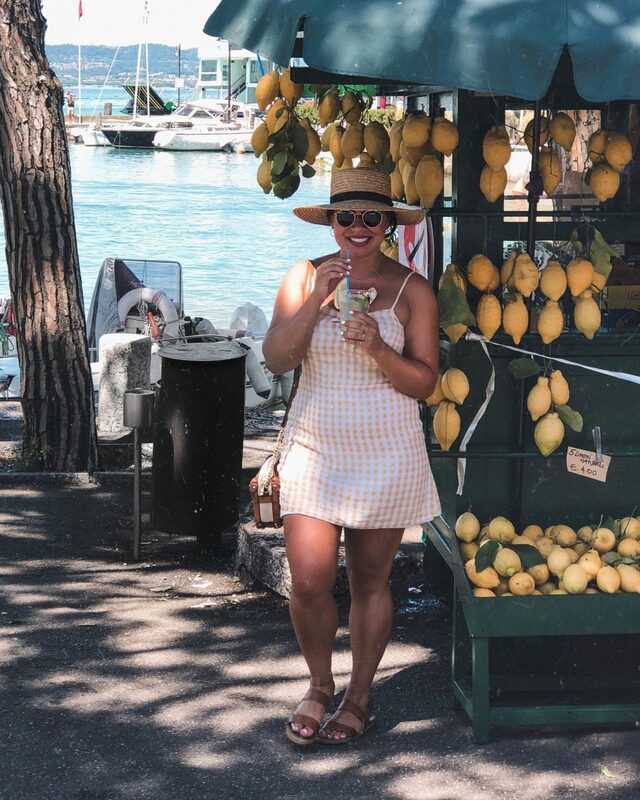 If you’re looking for something a little closer to the water, I’d recommend a holiday in Desenzano. There’s also a train station there, so it could potentially eliminate the need for a hire car if you’re not into the idea of driving on your Lake Garda holiday. 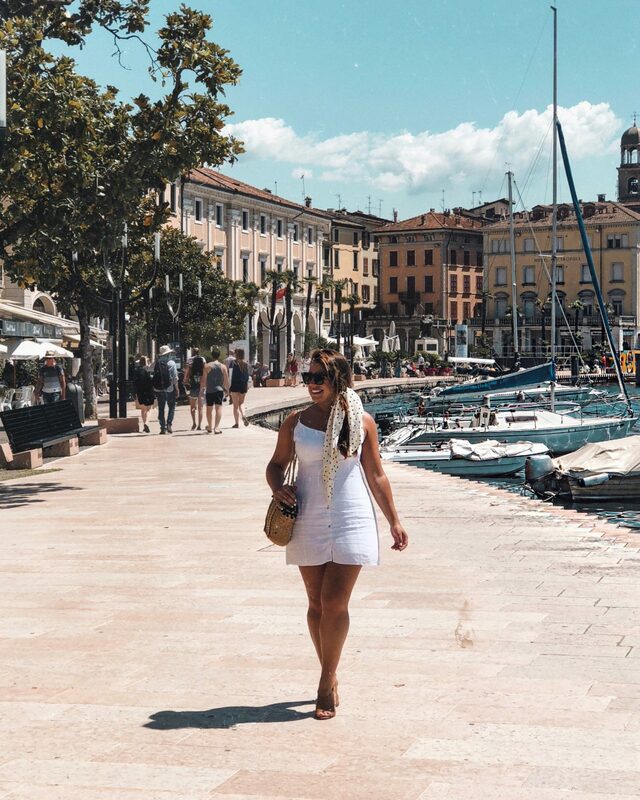 The closest town to Palazzo Arzaga is Peschiera, at the southern tip of the lake, but we spent more time in Desenzano, less than 15 minutes drive from the hotel. There’s everything you need here; bars, cafes, shops, restaurants, supermarket, beach club, the lot! 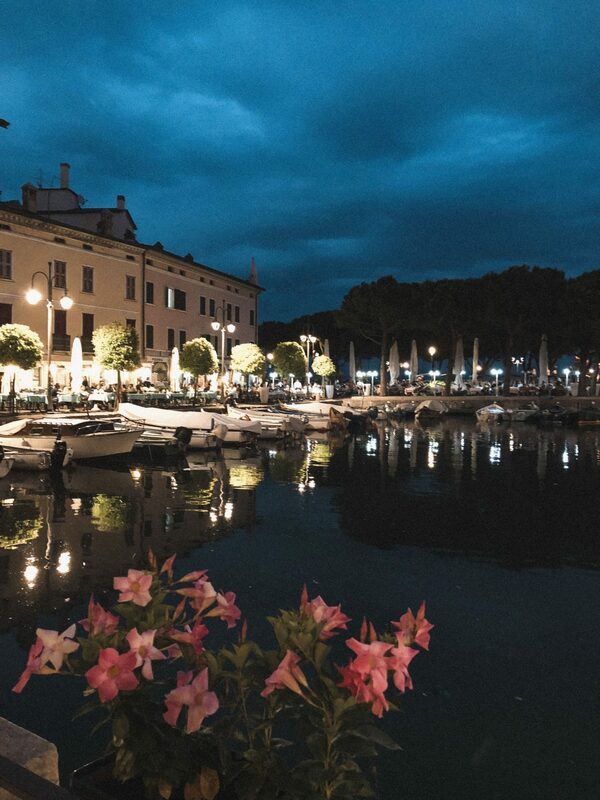 The area around Porto Vecchio is really nice at night for an al fresco dinner by the water. Next time, I’d definitely stay in this area. You can find deals with TUI here. Thirty minutes north, you’ll find the picturesque town of Salò with it’s long promenade lined with cafés and small boats. 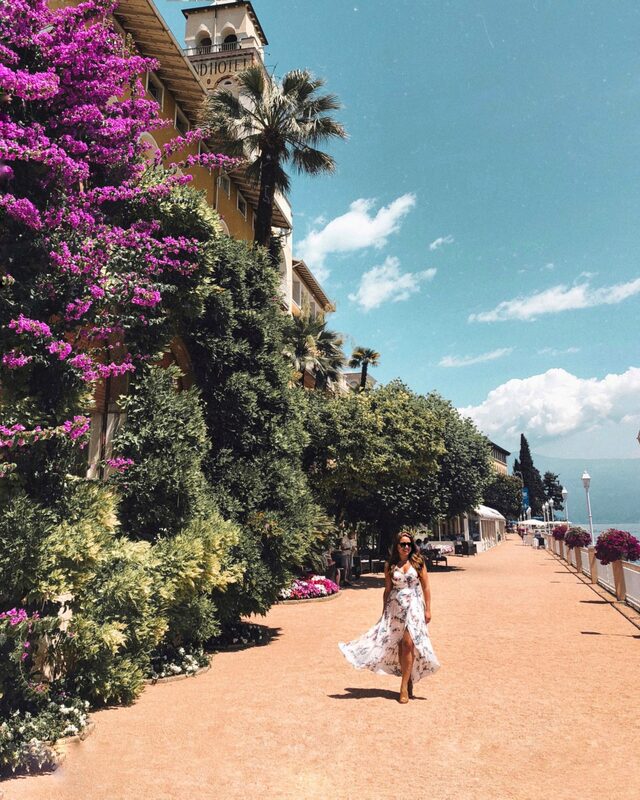 The instantly recognisable peninsula that juts out into the middle of Lake Garda is called Sermione and it’s the most popular with tourists. Stop for an ice cream from one of the countless gelaterias or a fresh lemonade and take a stroll around the medieval castle and Roman ruins. 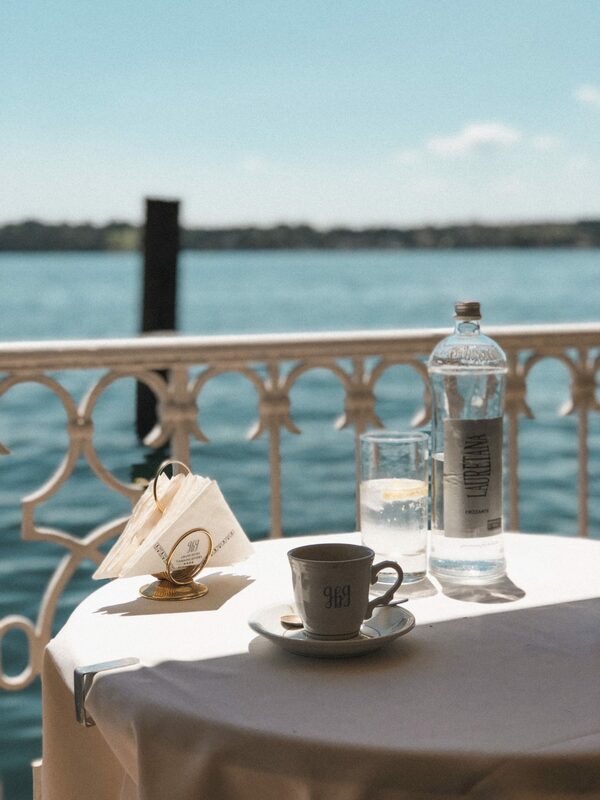 A few of kilometres along the coast from Salò, you’ll arrive into Gardone Riviera, stop at the stunning Grand Hotel for a quick drink. My number one activity would be to hire a boat, hands down my favourite part of the week (even though we had no idea what we were doing and it was overcast for most of the day). After swimming over to boats while we were at a beach club and asking how much to rent them (some said €750 for the day), I did a quick Google search and came across this place, sent a Whatsapp message to the phone number and had everything set up for the next day. It was €140 for the full day exc. petrol (which cost us €36), but they’ve got better offers if you take the boat for 4 hours in the morning. You don’t need any kind of experience or a licence, they’ll talk you through the rules – so listen carefully! We couldn’t quite get the hang of mooring, so we went to Punta San Vigilio where you can anchor and they’ll ferry you in to the pier. I’ll pop details of the restaurant below, but the area is great to hang out in and go for a swim. Absolutely excellent for people watching! 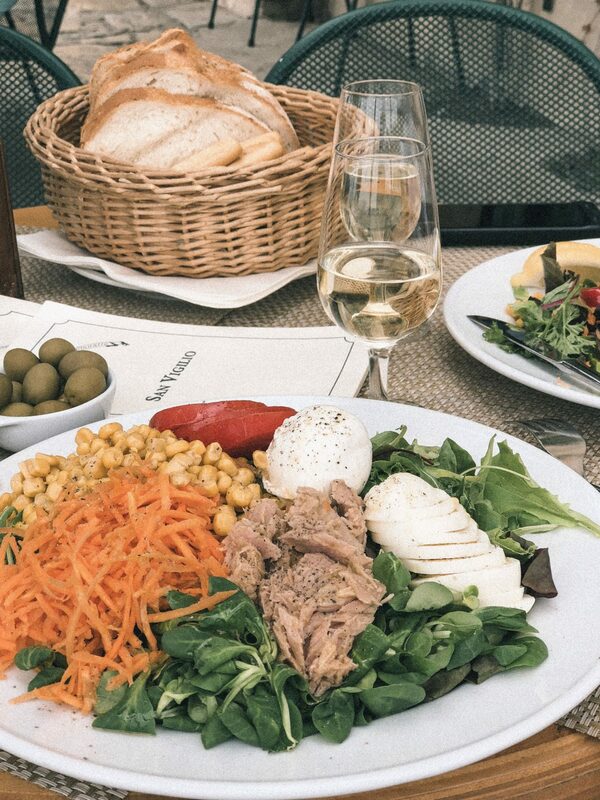 The restaurant at San Vigilio, has a basic but fresh and tasty menu. Mainly salad and seafood, kind of pricey, but you’re definitely paying for an unbeatable location. Oh and the wine is really reasonable at €4 a glass. A beach club wasn’t something I’d associate with a lake, but actually I don’t think I’d ever holidayed at a lake before, never mind swam in one! 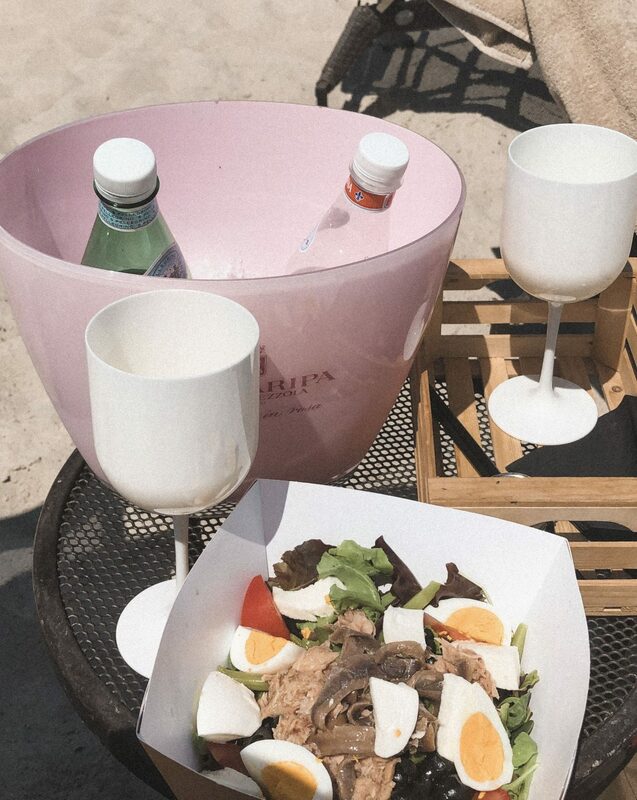 So, the other highlight of our trip was a day spent at Coco Beach Club in Desenzano. Sunbathing, eating, drinking, napping and swimming and you guessed it MORE people watching. Lake Garda has a lot of beautiful people and interesting characters, so it made for one of my fave days. The music is great and the food & drink is pretty reasonable, my only gripe would be excessive use of single-use plastics. Oh and the random squat toilets, but there are changing areas and showers too which is quite handy. 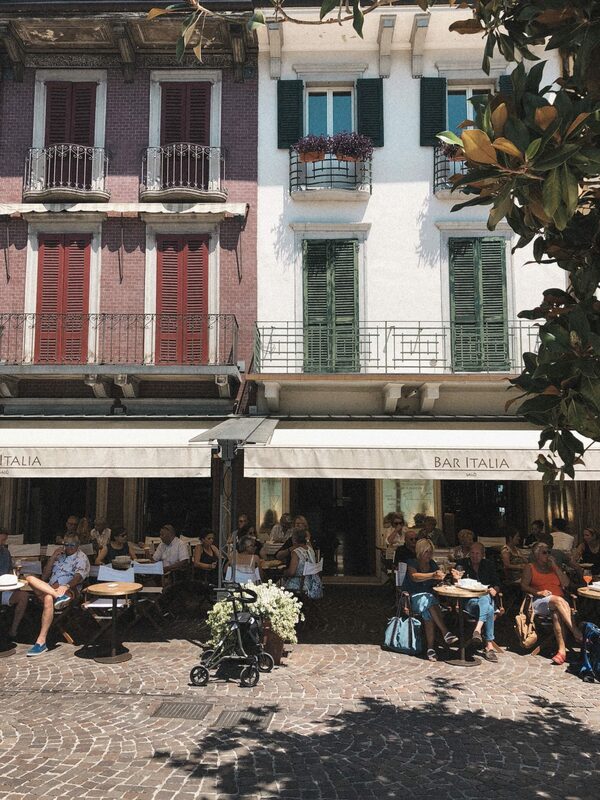 I mentioned the internal harbour in Desenzano, but if you walk up one of the tiny side streets to Trattoria Alessi, you’ll find another great place for people watching. The gorgeous trattoria is on a small cobbled walkway with tables lining the street (or you can sit indoors or in their courtyard). 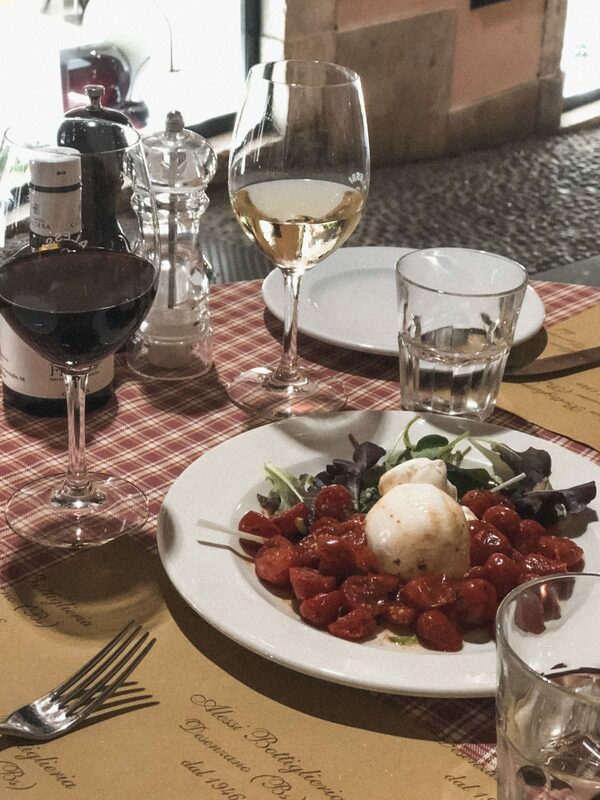 I order burrata at every opportunity in Italy, but their pizza was also excellent. Now I just need to decide if I should go back to see the rest of Lake Garda, or take a trip to Lake Como next. Any suggestions, let me know! For holiday wardrobe tips with links to buy, see my guide here.